The Korean summer is a beautiful season which welcomes fresh rain and hot breezes, transforming the country into a great festival of art, music, and literature, enchanting visitors from all over the world. You just have to head down one of Seoul’s bustling markets to revel in colorful lanterns and exuberant people celebrating one of the world’s most fascinating and sophisticated cultures. Korea serves up a delicious palette to sate every taste, from the avid sports fan to the tech genius with its multitude of conventions and conferences for which the capital has become so renowned. But while this modern metropolis of the East gets the buzz for its technological and economic prowess, the real treasures of Korea are steeped in a vast and intriguing history which dates back to the Joseon Dynasty and earlier. Korea is most beautiful through the eyes of the artist and art-lover alike, and all its regions – from the neighborhoods of Incheon to the breathtaking coasts of Busan – have something to offer. Koreans take great pride in the cultural and natural heritage which has flourished for centuries, and to this day it pays special attention to preserving its wilderness and honoring its traditions. Much of the artifacts and relics of Korean history are still living and breathing in its ancient mountains and dignified monuments. There are hundreds of locations across the peninsula offering a fulfilling experience for the art lover or historian; rugged mountains carving out the sky with their white-peaked caps and forested slopes melting into the azure coastline, elaborate hanoks overseeing fields of endless green, and picturesque ports that illuminate the night sky – all have the stuff of inspiration that artists chase so fervently. One of the great national treasures of Korea is Jeju Island, situated just off the south coast of the Korean peninsula. A popular holiday destination among locals, it is also a must-see for international travelers as well. Home to the majestic Halla Mountain – Korea’s tallest peak – Jeju is a year-round draw. The Hallasan National Park has a network of scenic trails and featuring stunning views of the landscape as well as the famous Gwaneumsa, an old Buddhist temple. Not only providing great material for an artist’s imagination, Jeju’s Seogwipo Continued Learning Center offers numerous classes on technique including muninhwa which is popular among foreigners seeking to gain insight into Eastern aesthetics. 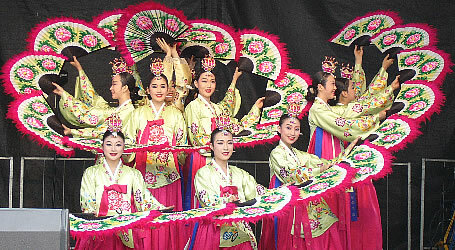 A perfect summer activity, the classes are engaging, informative, and insightful, and a great way to become more “hands-on” with Korean culture. There is nothing more immersive than taking the artist to the source of creation, a premise which is gaining popularity as an industry as well as practice, with all kinds of ventures from art-themed cruises with on-board classes to art techniques practiced in public parks. Taking off across the country as well as the world, this is one way in which artists can gain a sense of “community” via the artistic process itself, rather than individual endeavor alone. Although Korea’s natural wonders are plentiful and intoxicating, what a visitor marvels at in nature is paralleled in the architectural wonder of the many monasteries and palaces heralding from days of yore. Some of Asia’s most spectacular temples are nestled deep in the Korean mountains, including the legendary Magoksa, predating the Joseon period, Baegyangsa, renowned for its autumn splendor, and Haeinsa, a UNESCO World Heritage site to name but a few. These are but a small sampling of the vast network of unforgettable locations to make an artistic pilgrimage to, so don’t hesitate to look further afield. Of course, it’s not all about bold silence and tranquil ambience for the art lover – cities like Seoul and Busan are abuzz with galleries and festivals which celebrate Korea’s long history of art, from the ancient masterpieces of Choi Buk to the modern ingenuity of Han-Soo Lee. Both national and global exhibitions enjoy enthusiastic receptions at Korea’s art venues like the Seoul Museum of Art, the Museum of Korean Buddhist Art, the Museum of Photography and several others that cover virtually every period and genre like folk, classical, and contemporary around the world. There is no shortage for any artistic preference, and fulfillment is guaranteed. It comes as no surprise, then, that Koreans are just as passionate about bringing the arts to life in methods other than immortalizing them in a museum. The Korean summer offers the art lover endless opportunities to enjoy live music and entertainment, as well as a variety of visual and performance arts, film showcases, and more. The Puchon International Fantastic Film Festival is a highly-anticipated event just like its other counterparts in the movie industry. The Jecheon International Music and Film Festival delights audiences with a grand finale under the stars. A spectrum from Taekwondo to the Lotus to all the various aspects which make up Korea’s eclectic culture are featured during the height of festival season, drawing in some of the largest crowds across the continent. The famous and the fringe alike are on equal playing fields when it comes to gaining exposure in the art world in festival terms, perhaps making these occasions the most interesting, experimental, and sincere. Few nations exhibit a more prolific and dedicated adherence to the arts. Young students practice classical art and music vigorously, an integral part of childhood which is deeply-rooted in the essence of the country. Art lovers from the West will be especially enthralled with the tremendous amount of respect and support which the arts enjoy, as well as enraptured by endless sources of inspiration and imagination. Though Korea promises to satisfy the senses year-round, making the most out of summer is one of the most rewarding and memorable ways to revisit the world through an artistic lens. Credit goes to "Annie Harper"